Northrop Grumman has completed the initial ground test of a new motor that would power United Launch Alliance‘s Atlas V launch rocket. 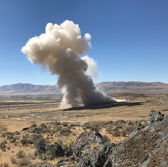 Tested in Promontory, Utah, the 63-inch diameter Graphite Epoxy Motor or GEM 63 will replace Atlas V’s old strap-on boosters starting July 2019 for the Space Test Program-3 mission, Northrop said Thursday. The test comes after three years of development under a cooperative agreement with ULA, with an upcoming U.S. Air Force certification test to follow in November. Northrop is also working on an XL variant of the GEM 63 that would boost ULA’s Vulcan Centaur rocket. Joint work between the two firms began in 1964 when Northrop’s predecessor company delivered Castor I motors for use with ULA’s Delta D rocket.